Cornet Technology showcases its 4G LTE Small Tactical Network IP Nodes (STINN) command post and manpack at AFCEA TechNet Augusta. Products meet the needs of expeditionary and coalition communications. 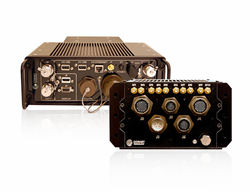 Cornet Technology's 4G LTE Base Stations are ideal for expeditionary and coalition communication requirements. Cornet Technology, Inc. a designer, engineer, and manufacturer of secure and non-secure communication solutions, will be featuring its line of Small Tactical IP Network Nodes (STINN) at the 2016 AFCEA TechNet Augusta Conference and Expo. The conference will be held at the Augusta Marriott at the Convention Center, Augusta, GA, August 2-4, 2016. Cornet Technology is exhibiting in the Olmstead Exhibit Hall Foyer: table #T76. Cornet Technology will be showcasing its STINN manpack and command post solutions. Staff will be available to discuss how these 4G LTE base station solutions fulfill both Expeditionary and Coalition Communication requirements. Learn more about our solutions at http://www.cornet.com. The AFCEA TechNet Augusta is “an award-winning symposium that enables participants to understand the challenges the cyber element introduces into a combat arms fight” (http://events.afcea.org/Augusta16/Public/Enter.aspx). You can register at http://www.afcea.org/events/register.cfm?ev=355. Cornet Technology, Inc. is a leading secure/non-secure communications solutions supplier to the defense industry and commercial markets in the United States and overseas. Its solutions deliver voice, video, and data communications and video surveillance and distribution solutions to some of the world’s most exacting users. Headquartered in Northern Virginia, Cornet has wholly owned subsidiaries in Germany, Japan, and India. All Cornet products are designed and manufactured in the U.S. at its 9001:2008 registered facility in Springfield, VA. Information on Cornet's solutions is available at http://www.cornet.com.